BELMONT, Calif. -- A brush fire near Belmont that shut down two northbound lanes on Interstate Highway 280 on Friday morning, has been contained. The fire was reported just after 9:50 a.m. near the I-280 and state Highway 92 interchange, west of Belmont, according to the CHP. 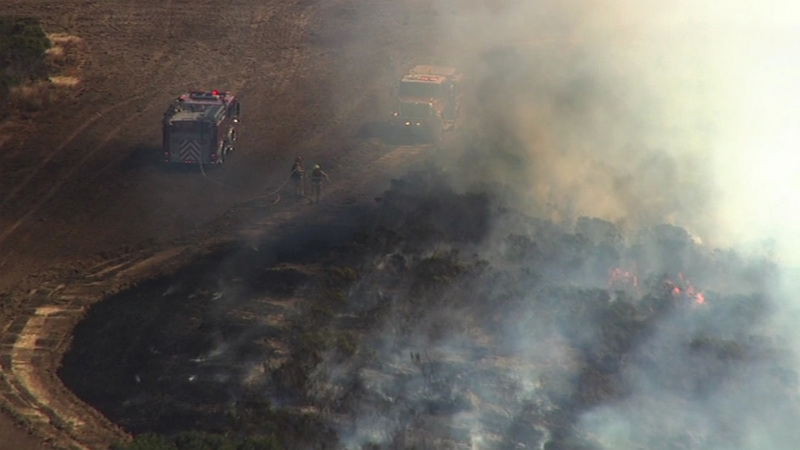 Cal Fire officials said the blaze had spread to 15 acres. Two far right lanes were shut down as crews responded to the blaze, the CHP dispatcher said. A San Mateo County fire dispatcher said crews were starting to arrive on scene around 10:15 a.m.
Belmont police tweeted the fire was contained and no injuries or property damage had been reported. Police had reported heavy smoke in the area, but said no evacuations were needed.